Mainland Machinery / Agriculture / Are Your Silos Ready for Your Corn? Are Your Silos Ready for Your Corn? 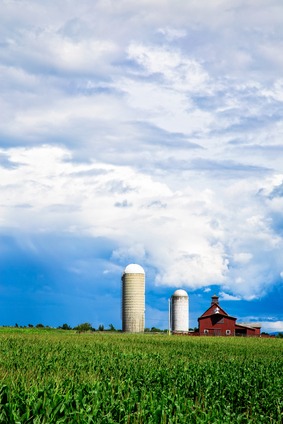 Are your silos ready for corn storage? It seems that every couple of months there is a bacteria breakout that sends folks to the hospital and causes major headaches for food producers. Among the common culprits of these outbreaks are contaminated lettuce and beef. There isn’t a lot of discussion about corn bacteria, but that could change with this coming harvest. Because of a dip in prices, more farmers are opting to store their corn in the hopes that the value will pick up in the coming months. This is when farmers need to be aware of mycotoxin contamination. Typically, corn will go into a storage unit retaining 14 percent of its moisture content. However, that content can waver anywhere between 13 and 20 percent. This puts the responsibility squarely on the farmers’ shoulders to monitor the temperature of those silos and stay on top of the moisture levels. Being lax in this regard can lead to swatches of corn that become infected with Penicillium mycotoxins. When left unchecked, a small zone of infected corn can quickly spread through the entire harvest. Many of the American corn samples were taken from the Corn Belt region (located in the Midwestern United States), crops which end up as feed for the major dairy producers. According to the results of the Alltech survey, it would seem that mycotoxin contamination is on par to match the same levels as last year. The zones with the most reported corn silage contamination are found in the Mid-Atlantic, Northeast, and Upper Midwest. Among the strains of mycotoxin, the most dominant is Fumonisin. The second and third most prominent strains are Fusaric Acid and Type B Trichothecenes. In the case of Type B Trichothecenes, many of the farmers have deemed the low levels to be of little risk to the crop. This is all part of the process that every farmer goes through as they asses quality over quantity. Move grain out of trucks and containers within a 6 hour time period: High moisture grain should be moved out of trucks and/or wagons within 6 hours. If you’re drying high moisture corn, make sure it gets into a holding bin with forced air keeping it as cool as possible for the duration of the process. Bacteria can also attach to grain when your sanitation is below par. Make sure your augur wells, pits, and dump stations are cleaned after every use. Aerate the silo or storage containers when it gets warm: When it gets to be 10 degrees warmer inside the silo than outside, you should aerate the grain. If needed, drying fans can be powered up to cool off the grain. The goal is to keep the heat out of the aeration process. It is best to inspect your storage units every 3 weeks. You should also be on the lookout for insects and sprouting at the top of the corn stack. A little due diligence will go a long way towards protecting your harvest.